Medici Marble & Granite is one of the leading suppliers of natural stone in Perth. We’ve more than three decades of experience working with granite, marble, and porcelain and we’ve built a reputation for excellence among both residential and commercial customers. We provide our Perth customers with a complete solution, including design, fabrication, supply, and installation, as well as ongoing repair and maintenance services when needed. Our solutions include stone benchtops, countertops, vanities, desks, and fireplaces. Our natural stone range includes marble, granite, and porcelain, and we also supply Perth with engineered stone, including Caesarstone, Q Stone, Essastone, Empire Stone, & Quantum Quartz. What’s The Difference Between Granite, Marble, and Porcelain? Each of the three different natural stones we work with has different properties that make them more or less suitable for different situations. However, in many cases, it is personal preference and design choice that are the key decider. Granite is a highly durable stone that is hard-wearing, scratch resistant and heat resistant. It comes in a variety of colours and patterns, including whites, blacks, reds, browns, and yellows, and is normally highly polished. 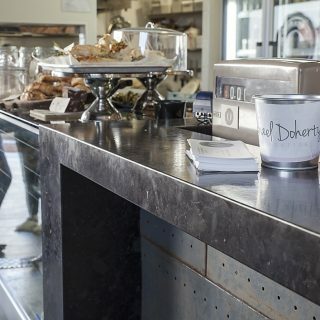 Each slab is unique with specks, flecks, and veins, ensuring that your benchtop or other feature is unique. Marble is a beautiful natural stone that can be used either polished or unpolished. Colour choices are more limited than in granite, but its elegance and luxury make it highly sought after. Marble is softer and less durable than granite and more likely to scratch or become stained. Busy areas, such as at sinks, may become worn, get scratched, and start to look a bit dull, but for some, this is part of marble’s charm. Choosing a darker stone and using a protective sealer can help hide marks and protect against staining. Porcelain isn’t actually a natural stone – it’s a ceramic made from heating clay. It’s the ideal material for any hard-wearing situation. It’s heat and fire resistant, scratch resistant, and stain resistant. Because of this its extremely long-lasting and durable and is even suitable for outside use. Porcelain is a great choice if you want a finish that still looks like new a decade after it’s been installed. How Much Does Natural Stone Cost? The price you pay will depend on the colour and type of stone you choose, plus the labour involved in creating the product you want and the cost of installation. The cost of labour and installation will depend upon your design, access to your site, and the size and complexity of the job. 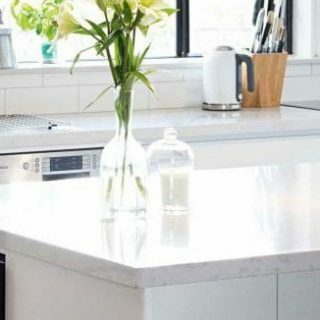 Stone Kitchen Benchtops – Long-lasting, beautiful and hygienic; natural stone is a great work surface for preparing your meals, regardless of whether that’s for your family or in a busy restaurant. 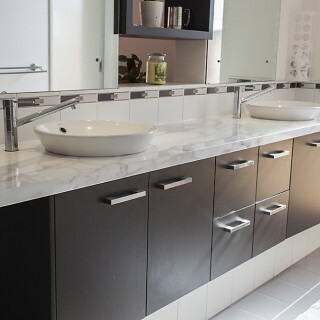 Stone Bathroom Vanities – Natural stone provides quality, comfort, and style for one of the most important rooms in your home. Stone Splashbacks – Protect your walls in your kitchen and bathroom with a natural stone splashback. Stone Reception Desks – A stylish reception desk is a stylish way for your business to create a great first impression. Stone Fireplaces – Naturally heat-resistant, natural stone is the ideal material for the centrepiece of your room. Don’t see what you’re looking for? That doesn’t mean we can’t help. Contact our team today on (08) 9303 2697 or through our online contact form.